Denim-clad Levi’s CEO Chip Bergh rings the opening bell at the New York Stock Exchange. In a break from its longstanding dress code, the New York Stock Exchange allowed jeans on the trading floor today (March 21), as Levi’s, the world’s largest denim brand and inventor of the modern blue jean, once again listed on the exchange. Levi’s reportedly handed out jackets to all the traders. Some took full advantage, dressing in denim from head-to-toe. The company, which had gone public in 1971 but was taken private again after profits and its share price fell, debuted under the ticker “LEVI.” Yesterday it announced that it expected to sell at least 36.7 million shares at $17 apiece (pdf), raising more than $623 million, and valuing the company at more than $6.5 billion. Update: Levi’s shares began trading on the New York Stock Exchange at $22.22 a share. Levi’s has seen a strong turnaround in its business over the last few years, under the leadership of Chip Bergh, who took over as CEO in late 2011. The company saw its sales fall as wholesale channels it relied upon, such as department stores, struggled, while fast-fashion brands and other labels drew customers away. At the same time, consumers stopped buying as many pairs of jeans and filled their closets with stretchy, comfortable leggings and yoga pants. 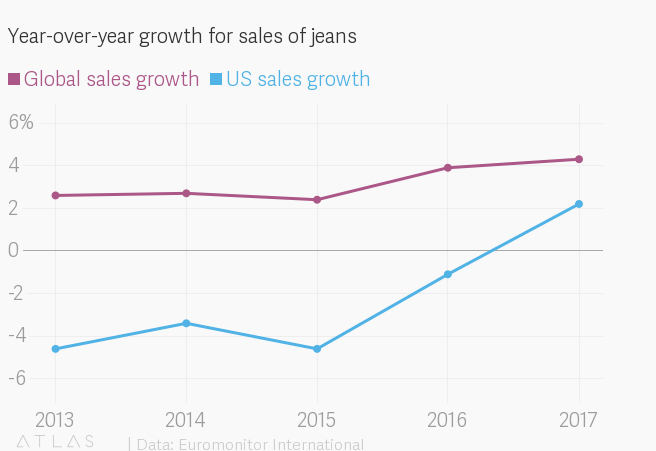 For years, denim sales in the US were falling, according to data from the market research firm Euromonitor International. But Levi’s adjusted, adding stretch to even its famous 501s, focusing on new fits such as the bottom-accentuating Wedgie, developing its direct-to-consumer sales, and diversifying its business. Most of the company’s sales are in men’s bottoms, but it has steadily pushed sales to women, and focused on nudging customers toward other items beyond jeans, such as logo t-shirts and trucker jackets. 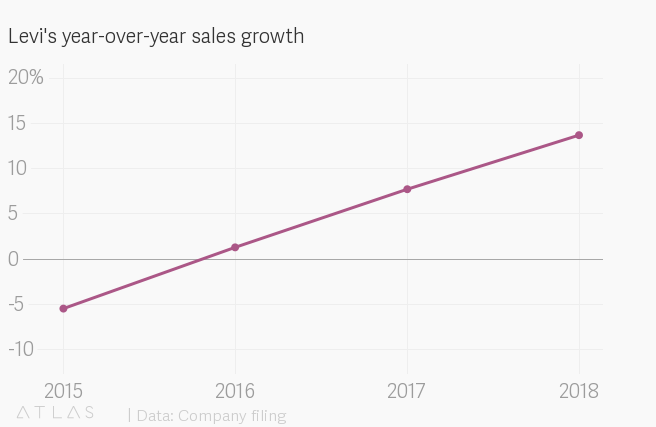 After years of falling sales, Levi’s returned to growth in 2016, and has been climbing since. Bergh told Quartz last year that he thinks Levi’s is connecting with young shoppers in a way that it hasn’t for decades. Now it’s trying to do the same with investors. The traders on the floor in their Levi’s today seemed to feel positive about the company at least. It’s not, however, the first time they’ve been allowed to wear jeans to work. A decade ago, they got another dispensation to wear jeans, in celebration of Gap’s 40th anniversary. Denim on the floor of the exchange, way back in 2009.